CoSPs are transforming edge networks to The Next Generation Central Office (NGCO) with Intel infrastructure for increased service velocity with improved flexibility and efficiency. 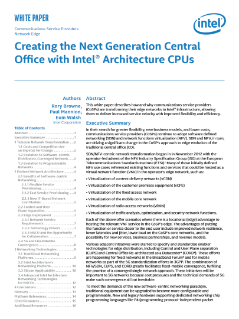 This paper discusses the role Intel plays in The Next Generation Central Office (NGCO). The NGCO is an SDN and NFV-enabled CoSP location that is architected for delivering agile wireline or mobile network infrastructure... and associated service delivery. The VNF performance of the industry is witnessing on the latest Intel® Xeon® Scalable processors reconfirms this as the optimal choice for 5G and fixed edge network evolution.